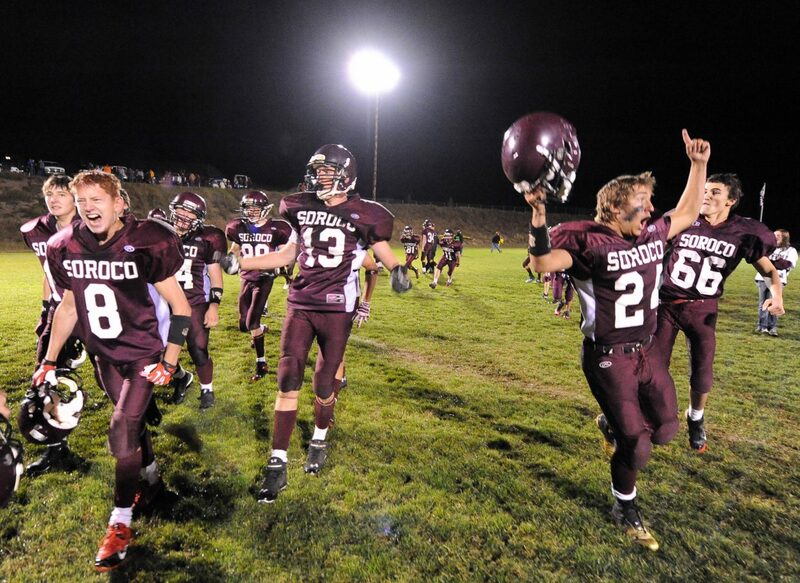 A year ago, a win against Hayden, the first in a decade, sent the Soroco players dancing onto the field. Now the Rams head back into the cross-county clash hoping to win again, secure a second-place finish and make the case that they belong in the 8-man football playoff bracket. Steamboat Springs — Colorado’s 8-man football playoff bracket will be set Sunday at the Colorado High School Activities Association offices in Aurora. If it can pick up one more win, Soroco has a chance to be on that list of 16 teams — six league champions and 10 at-large selections. That won’t be the driving force when Hayden and Soroco clash at 7 p.m. Friday in Oak Creek, however. No one needs greater implications to get fired up when there’s pure rivalry to keep things burning. Soroco and Hayden have traded wins since the Tigers dropped to 8-man football in 2012. Hayden won that first season in blowout fashion, 49-7, and Soroco returned the favor last year, winning in the series for the first time in a decade, 26-6. Now the Rams come in hoping to secure second place in the Western Slope League and hang on to the chance for a playoff at-large spot. In their way is a bruised Hayden squad with plenty of motivation to stop them. Soroco got its defining win of the season Oct. 3, 18-10 against Rangely. That put the Rams in the driver’s seat for second in the league, a position the team’s young roster has grown into as the season has progressed. Count Keller among those feeling more comfortable. He stepped into the coaching position in the offseason when no suitable alternatives applied for the head coaching job. Now, he has his team on the doorstep of the playoffs, with wins in its past two games and riding a running game that’s coming on strong. Soroco overcame a midseason injury to running back Isaac Jonas and ran the ball well against Rangely, and even better last week against Plateau Valley. It leaned on the combination of junior tailbacks Storm Veilleux and Eric Logan, who combined for nearly 400 yards. Hayden, meanwhile, has struggled with injuries since starting quarterback Garrett Camilletti left late in an overtime loss to Rangely. He’s done for the season, and his backup, freshman Keyen Camilletti, was knocked out early in last week’s loss against Norwood. He’s expected back this weekend, but senior tailback Jack Redmond, who also left last weekend with a concussion, will be out. That leaves senior wide receiver Tanner Guire as the team’s lone leading playmaker from the season’s early days. Baumgartner said practice this week has been spent working on ways to work Guire, Camilletti and freshman Garret St. Clair into the backfield. In plenty of ways, it would have been a much different game if it were played in September. In other ways, it wouldn’t, as no matter the players on the field, it should be an exciting night when Hayden and Soroco meet. “We respect the heck out of those guys, and it’s going to be fun,” Keller said.